What a cool diorama! I feel like this does such a good job of capturing what's supposed to be going on. you really feel like the Iron Hand is getting crushed against the wall by the sonic weapon. The way the wall is cracking around him beneath the pressure and how the marine is posed are perfect. The helmet flying off behind him is just the icing on the cake. Really, just a wonderfully composed piece. 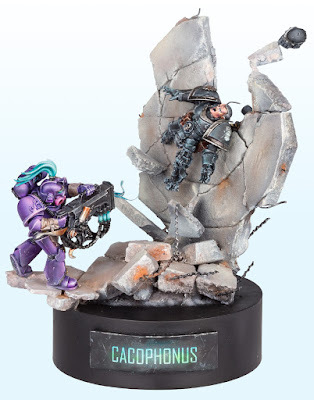 The painting is fantastic as well, with the Emperor's Children marine standing out in the bright purpley pink and the Iron Hand having a much more natural looking black. His armor looks much more functional and spartan than the traitor's, just as it should be. Everything is smooth and crisp and still uses true metallics, which is nice to see in this age of non-metallic metals. It gives it a very realistic feel. The cement and rusted rebar do a great job at framing it all too. The neutral tones really let the models shine, and it's light enough to provide contrast against the darker marines. Like I said, this is all around a pretty amazing diorama.